Video is everywhere. You've watched it, you've shared it, why not create it? ScreenFlow is an award winning and easy to use video editing, screen recording and sharing tool from Telestream. Capture the highest quality screen recordings. Adjust and revise your video using the easy-to-use editing interface. Create high quality software or iPhone demos, professional video tutorials, dynamic presentations, corporate training and more! Trust Switch for frame-accurate playback of all your professional media files, including embedded captions and subtitles. Multi-format playback support includes MXF, IMF, GXF, MPEG-2 Program Streams and Transport Streams, and formats such as MOV, MP4, WMV, and more! Switch can also play HEVC and 4K files, DNxHD, and JPEG2000 (requires Switch Plus or Pro). Switch has all the playback control features you’d expect in a professional player such as JKL navigation, fast forward and rewind, slow motion, as well as single-frame forward and back. “Jump To” allows you to jump to a specific timecode, frame or time in your video. Switch will play back embedded CEA-608 & CEA-708 captions, as well SCC, DVB, TTML (iTT and SMPTE-TT captions) and WebVTT, SRT and STL subtitle files. Switch is the only software player with full support for CEA-708 caption decoding, including advanced 708-only features like Unicode character support. Switch will also decode captions from virtually all wrappers and formats, so you can verify captions within your MXF or Transport Stream file. 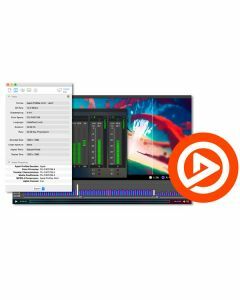 Check video and audio properties such as audio channels, speaker labels, aspect ratio, clean aperture, bitrate, frame rate, metadata, encoding formats and more. You can also load secondary audio or closed caption files to check sync. Use the Audio Meters to solo or mute audio channels, and inspect true peaks and momentarily loudness values. Switch Pro adds a loudness panel that calculates gated (BS.1770-3) or ungated (BS.1770-2) loudness levels. Compare Alternate Media lets you open additional media files to compare with your primary media file. Up to sixteen alternate media files can be opened. Once opened, all of the files are listed on the View > Alternate Media File menu where they can be shown in Full View, Split View or Difference View. Great for checking your multiple adaptive bitrate files in ABR workflows or easy comparison of multiformat media. Use the Timeline feature to view the GOP structure of a video segment, highlighting the I, P, and B frames. You can also see the data rate information associated with the video. Preview your files on a broadcast monitor or other devices. Switch Pro supports HDMI/SDI hardware output via AJA or Blackmagic Design devices for preview and quality check. Switch supports the Blackmagic Design SDK, and AJA Kona 4, Kona 3G, T-TAP, Io 4K, and Io XT. Switch also adds the ability to view Vertical Ancillary (VANC) data on an external monitor. Switch Player lets you visually QC DPP files on the desktop, playing back the files as well as displaying DPP AS-11 MXF metadata. Switch was among the first players to achieve DPP/AMWA certification as part of the DPP (Digital Production Partnership)’s Compliance Program. Switch displays all the relevant media information about your file in an intuitive, well organized interface. The inspector is deep enough to be meaningful, without giving users so much information that it becomes cumbersome. By switching to edit mode, users can modify settings and export a new file. Switch lets you specify a new file format; a new video or audio codec; trim, scale or crop the video; add metadata (Pro only), and much more. Export to Apple ProRes*, H264, MPEG-2 Video, MP4, MPEG-2 program streams and transport streams. Switch includes the ability to pass-through audio and video on export, or omit the video and export as an audio only file. In the audio tab, you can split or join different audio tracks, rearrange audio tracks; change speaker assignments, then change the audio format and sample rate. Switch also supports downmixing: take a file with eight channels and mix it down to stereo. Export your video directly to Vimeo, YouTube, or Facebook from within Switch. Select export, choose your destination, and Switch will publish directly to your destination and save a local copy on your computer. Switch will create the appropriate files for your destination, taking the guesswork out of encoding and submitting content. Choose the iTunes export preset to create packages ready for distribution to the iTunes store. This creates an asset-only iTunes package file (a .itmsp file) which includes the media content, secondary subtitle or audio files, chapter information, and an XML file.